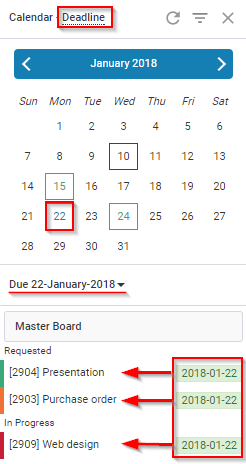 How to make use of the Deadline Calendar? All of the deadlines are visualized in the Calendar integrated with Kanbanize. 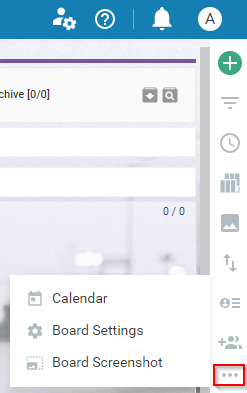 To open it → go to the sidebar on the right side of your Board interface and select Calendar from the three doted icons. From the calendar, you can monitor all your datе-related information. The default value is: Deadline. Upon selection of a specific date in the calendar, the system searches across all projects and boards and generates a list of all cards, which have a Deadline that day. In the example below (Imаgе. 1), the selected date is 22nd of January and the system has generated a list of 3 tasks having this deadline. Moreover, it shows the Board names where cards are located and the current state of the tasks (Requested, In Progress, Done). If you choose one of the regular fields (for example: Created at) and select a specific date from the Calender, the system will run a report for all cards that have been created that day. The same principle applies to the rest of the fields. You can use the filter to narrow down your search and monitor specific boards and certain cards that match your requirements. - Filter cards assigned to "User X" only –> select the pill "Assignee"-> define the user -> Apply the Filter. - Filter cards of a certain priority -> select the pill "Priority"-> define the priority -> Apply the Filter. - Filter cards from a specific board -> select the pill "Board"-> define the Board -> Apply the Filter. * Users can also filter data by custom fields. 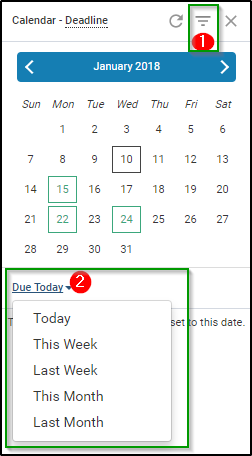 You can also add an additional filter from the Due Date Link (Imаgе 2 - p.2) to see all cards which due date expire by day, week, or month.